LittleEllieMae: 2013 Teen Choice Awards - Fashion Do's and Don'ts! 2013 Teen Choice Awards - Fashion Do's and Don'ts! The Teen Choice Awards is an annual award ceremony in LA, USA. Its a bustling and fun evening, something I look forward to watching every year because so many of my favourite celebrities attend! Fashion is a huge part of the evening, and today I'm going to review the do's and don'ts from The Teen Choice Awards 2013 (August 11th) for you! First up is, host of the evening, Lucy Hale who arrived to the 'blue carpet' dressed in Houghton top and skirt and Stuart Weitzman shoes. This is actually one of my favourite outfits of the whole evening; I think its so chic but still fun and girly for the occasion! One of my favourite celebrities ever, Demi Lovato, stunned the blue carpet with this rocky but sophisticated outfit. She rocked leather trousers, a beaded black blazer (tongue twister right haha?!) and white t-shirt. She kept it simple but definitely demi-fied. Love it. The gorgeous Nina Dobrev stood out with bold prints as she wore a J. Mendel top and matching pants. Dolce & Gabbana shoes, a Devi Kroell bag, and Martin Katz earrings - she looked stunning. I especially love her cute clutch bag! 'Scandal' star, Kerry Washington flaunted her great legs in a Stella McCartney long sleeve mini dress and Christian Louboutin shoes. I NEED THIS DRESS IN MY LIFE! I may have fallen in love; Stella McCartney pulls it out the bag every time, and Kerry does a great job wearing it too! Selena Gomez never fails to amaze me on the fashion front. Last night she wore a Cushnie et Ochs dress (complete with double thigh-high slits! ), Nicholas Kirkwood shoes, and Neil Lane jewelry. Selena has always been one to dress sophisticated and chic and last night was no exception. The newly turned 21 year old showed off her killer legs and amazing body in this dress. Oh Miley Miley Miley... sigh. The ex- Disney star has turned to the 'rocky, out of control grown up' look, apparently. I can't say I like any part of this outfit, including the hair and makeup. Sorry Miley, I really want to like it - but I just can't. It kind of reminds me of a bat. Actress Hana Mae Lee sure stood out in this outfit. From the boxy dress with tail to the outrageous 'I AM A MAN' headpiece... I'm not really feeling this outfit, sorry Hana! Its just too much. Although I am always digging the Doc Marten boots (snap!) and well done for being original I suppose. Hailee Steinfeld definitely turned heads in a House of Holland printed dress, Oscar Tiye shoes and an Amanda Pearly clutch. As much as I usually adore Henry Holland's designs, I'm just not feeling this one. It kind of reminds me of a christmas cracker... Her hair is pretty though. Lastly is the one and only Rebel Wilson. Yep, that's right, the 'Pitch Perfect' star showed up to the award ceremony wearing a black and hot pink wetsuit with her name on. She is a comedy genius and legend; this definitely made me giggle! Although, I wouldn't advise other celebrities turning up to award ceremonies dressed like this (can you imagine Selena Gomez?! ), Rebel brightened everyone's evening for sure. 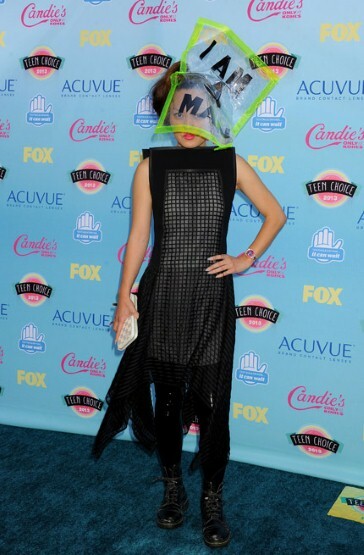 Overall, the Teen Choice Awards 2013 did pretty well for fashion. I can't wait for next year! What was your favourite outfit of the night?! Let me know!